Global Read Aloud launches today so perfect timing to read the latest adventure of Fenway and Hattie! While enjoying a game of keep away, Fenway spies that menacing chipmunk and in his quest to catch the chipmunk, Fenway gets stung on his paw by bees. Ouch! 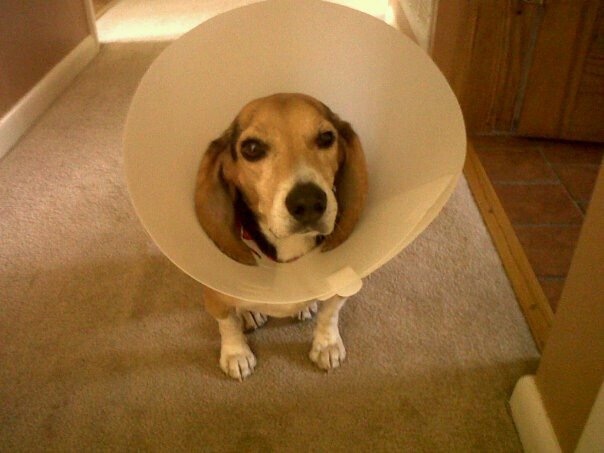 The story continues with Fenway’s account of visiting the vet (aka Spicy Breath and Table of Panic) and enduring the Cone of Doom. Hattie is supposed to his best buddy but she keeps giving him baths and applying yucky cream on his paw. Being a dog is tough! Etta can emphasize with Fenway. She has had first hand experience with the Cone of Doom. She did not like it either Fenway! Each time I read Fenway & Hattie, I know that I am blessed to have Etta in my life. Having the unconditional love of a dog is a precious gift. Thank you Victoria for that beautiful reminder. I hope Fenway will be sharing more of his adventures with Hattie! 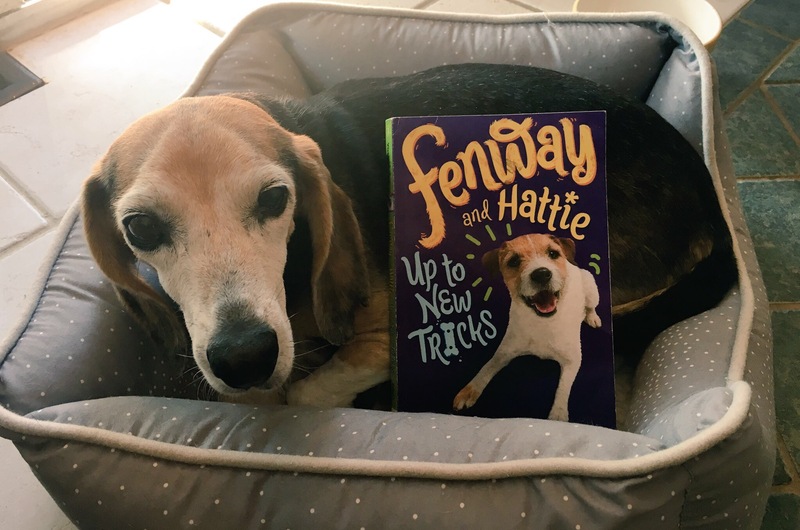 Special thanks to Victoria for providing our #bookexcursion group with an advance copy of Fenway & Hattie Up to New Tricks, which will be released on January 2, 2018. 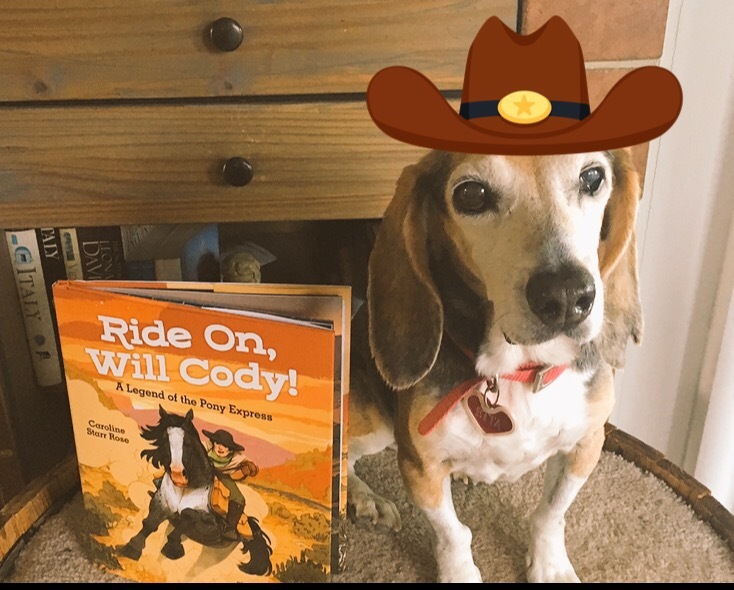 Participating in #classroombookaday, I am constantly hunting for picture books to share with students from a variety of genres; therefore, I jumped at the opportunity to read and review Caroline Starr Rose’s new historical fiction picture book Ride On Will Cody. Written in lyrical verse, Caroline Starr Rose beautifully tells the legend of young Will Cody who later gained notoriety as folk hero and Wild West showman, Buffalo Bill. Her precise choice of words perfectly captures the extreme weather conditions and harsh terrain that Pony Express riders faced on their daily routes. Joe Lillington’s illustrations support the text by dramatically depicting the riders’ arduous journey. At the end of the book, the author shares historical research about the Pony Express and Will Cody. As a teacher, I appreciate that students can read facts and gain a better knowledge of America’s westward expansion. Special thanks to Caroline Starr Rose for providing our #bookexcursion group with a copy of Ride On Will Cody, which was released on October 1, 2017. Special thanks to Tracy Marchini for sending a copy of her debut picture book to our #bookexcursion group. It was released in August 2017. Lives on Peek a Boo Island in Maine and has an older brother named Erik and little brother named Leo. It’s the first day of school but there is an empty chair at the breakfast table. Piper’s brother, Erik now lives on the mainland because there is no high school on Mink Island. To ease her sadness, Piper decides to wear Erik’s monkey earmuffs. Unfortunately, everyone else does not approve of her accessory including her new teacher Ms. Arabella. Unwillingly to take off the earmuffs, Piper decides to skip school to avoid Ms. Arabella and hides out in a tree. Little does Piper know that it is the Fairy Tree. Her neighbor Mrs. Pennypocket tells her about the tree’s history and the way the tree works-you take a treasure and you leave a treasure. Read this charming story to find out what treasures Piper gets and what she leaves in return. So excited to meet Piper and can’t wait to share her with my transitional readers. Children will enjoy Piper’s plucky disposition. Currently, there are five books in the series. 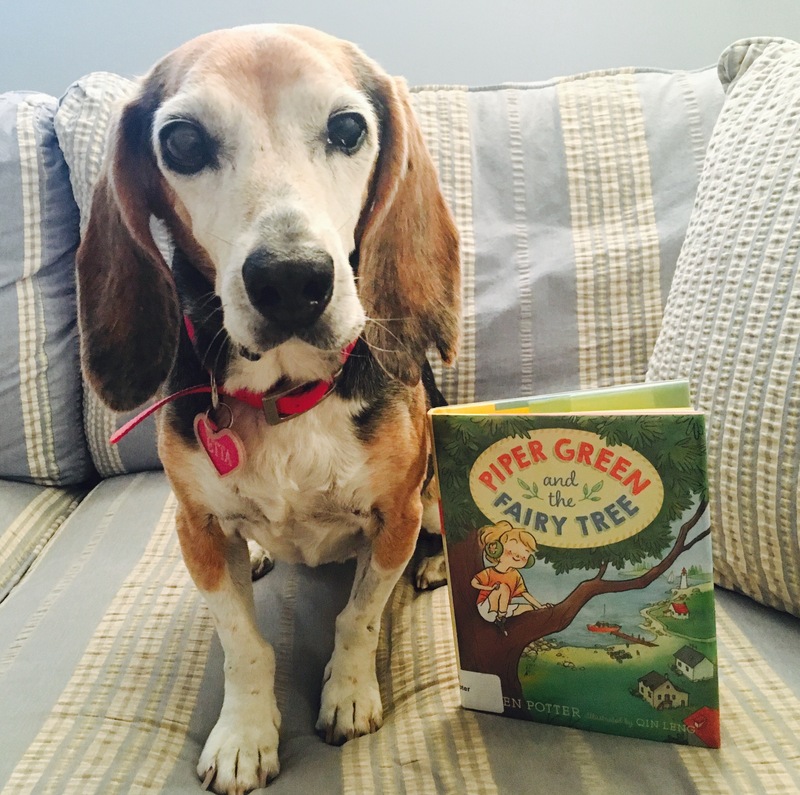 It’s awesome that Etta can apply her own knowledge and experience to the Fenway & Hattie book in order to have greater understanding and a more meaningful time with the book! Your dog is so cute! Have a great week! Lol…I love reading Fenway to hear his point of view. It makes me imagine what Etta thinks. And it’s fun to share books with her! Thanks for reading! I love Piper Green. I just got a new one because the author was at the Nerdcamp I went to last weekend. I can’t believe I didn’t know about this series. It’s perfect for my transitional readers! 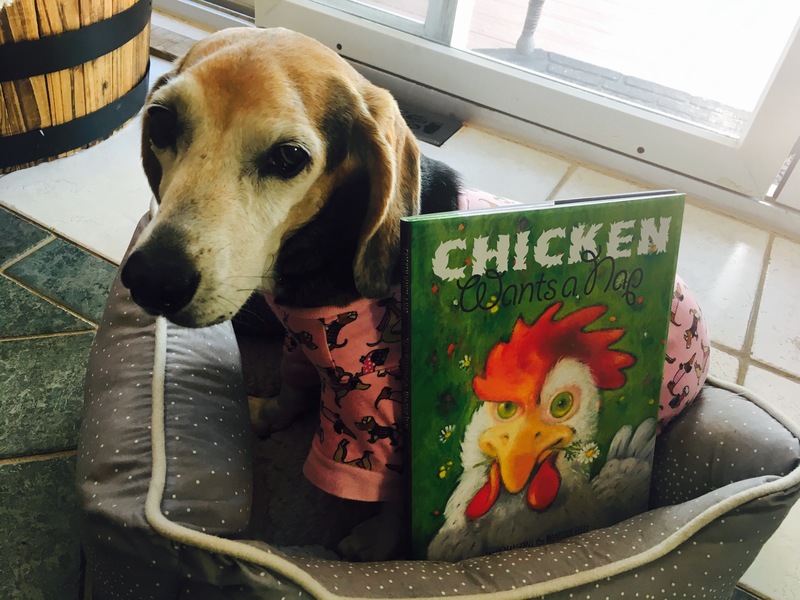 Chicken Wants a Nap looks like a delightful picture book. Piper Green is one of my favourite characters.